LaGuardia Corner Gardens | SoHo Memory Project. As we all know, SoHo proper has absolutely NO open space, not to mention green space. We once had a few parking lots, but those have all be developed, so we must venture across Broadway or West Broadway or Houston Street to get a glimpse of the sky. In the past, I’ve written about public spaces near SoHo that residents visit and cherish for lack of their own. First, in 2011 I wrote about Bobby Bolles Park, now called Sunflower Park, the small triangle of land at West Broadway and Watts Street where Bobby Bolles placed his welded sculptures until they were removed by the Parks Department. Then, I wrote about Thompson Playground (now called Vesuvio) in 2012, where all of us SoHo kids learned how to swim. 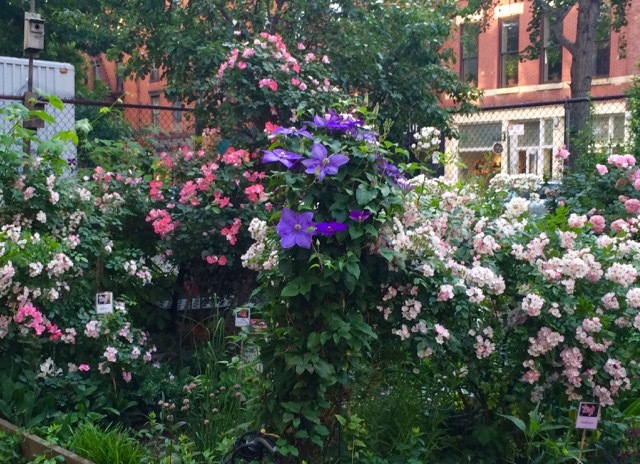 In 2013, I wrote about The Elizabeth Street Garden, an all-volunteer-run greenspace on Elizabeth between Prince and Spring in NoLiTa that hosts various events for families. I have now come to my fourth in this series of celebrations of the few open air oases in our corner of this urban jungle: The LaGuardia Corner Gardens (LGC). In 1974, on a vacant lot at the southwest corner of LaGuardia Place & West 3d Street dubbed “The Corner Garden,” a loosely formed group of Village residents began to garden on small plots, one of whom was my best friend’s mother, Ingrid. Ingrid used to bring us to help her plant and weed, and I probably wouldn’t remember it so well if my first bicycle had not been stolen from just outside the garden’s gate while I was picking strawberries. It's currently strawberry season, so this must have happened around this time of year in about 1975. But this story is not about me and my ex-bike, it’s about our neighborhood's scarce and valuable green space! In the summer of 1980, the garden’s land was sold for development. The Corner Garden, as it was known, ended with the arrival of a bulldozer, and was replaced by the apartment building where that stationery store is today. Ever resourceful and resilient, in the spring of 1981, several of the gardeners, led by Cheryl Small, Norma Turrill, Susan Kocki, Gean Mathwig, David Blake, Sandy Klabunde, and others, formed LaGuardia Corner Gardens, Inc., as a 501(3)(c) non-profit corporation. The gardeners negotiated with NYC’s GreenThumb program and Community Board 2 to move the garden to barren land a block south, on city property adjacent to a supermarket, where it is today. After many Community Board meetings and hearings, and over some opposition but with the overwhelming support of the majority of local residents, the garden obtained approval to develop the space as a garden. The gardeners spread the dirt and removed the rubble, plots were assigned, a wood shed was built to house the tools, and the planting began. In April 1985 an underground connection to the water supply was installed, making the garden self-sufficient. Since then, LGC has been a cherished community hub where neighbors get together and enjoy a bit of nature and serenity in our otherwise uber-urban neck of the woods. The future of the garden is at present unknown. LaGuardia Corner Gardens is on land owned by the New York City Department of Transportation. LCG’s members have sought to transfer the site to the Parks Department in order to protect the garden from development. Both Community Board 2 and our NYC Council Member support the transfer, but NYU has blocked the transfer.